Breathable Indoor Dust & Moisture Protection. Made with Sentrex fabric, Multibond is a 3-layer polypropylene non-woven mid-weight cover offering a superior level of dust resistance. The dense, polypropylene fibres are non-abrasive and have been treated to repel moisture. 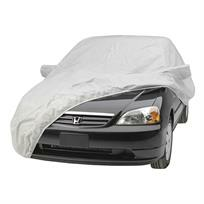 At the same time it's breathable, to prevent the vehicle from "sweating".